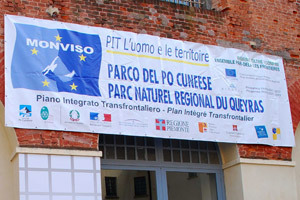 The Parco del Po Cuneese and the Parc naturel Régional du Queyras, within the European Programme for cross-border cooperation (Alpi Latine COoperazione TRAnsfrontaliera), have implemented the Integrated cross-border plan, PIT (Piano Integrato Transfrontaliero/ Integrated Cross-border Plan) “Monviso: l’uomo e le territoire” with the aim of developing the Monviso area by growing relations between the people and the territory. Actions envisage participation and networking to protect and enhance local resources and generate the opportunity for “slow tourism”. The PIT cross-border territory goes from the French mountain areas of Guillestrois and Queyras (the north-eastern part of the Département des Hautes-Alpes), through Colle dell’Agnello, to the Roero hillside across Valle Maira, Valle Varaita, Valle Po, Bronda and Infernotto and to the area around Saluzzo, to Racconigi and Savigliano (north –western side of the Cuneo Province). 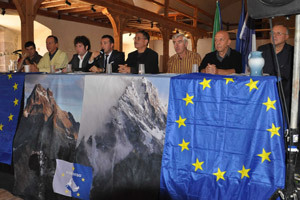 The PIT MONVISO activities officially started on 29th January 2010 and will end on 25th July 2013.